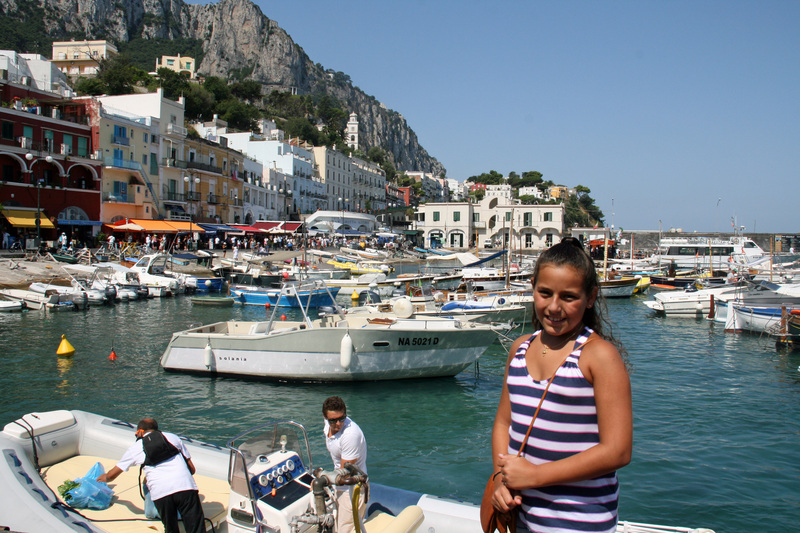 When in Italy, visiting the beautiful island of Capri should be on everyone’s itinerary. 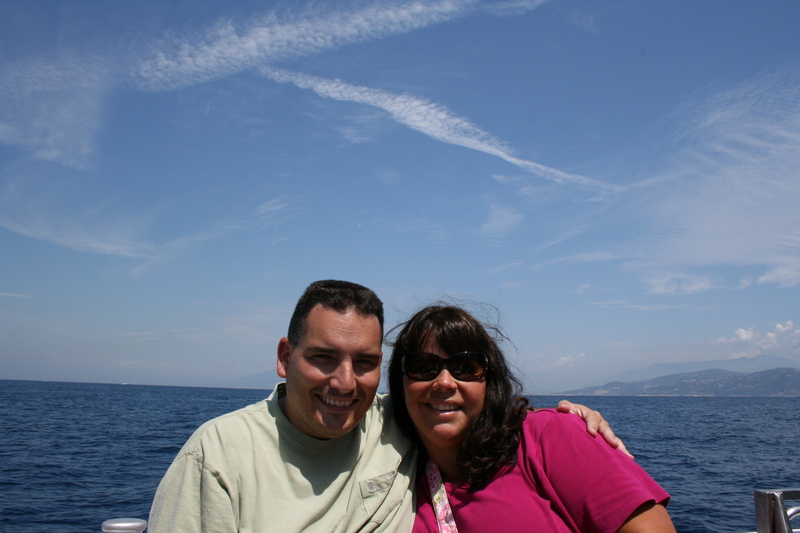 Every time we vacation at the Amalfi Coast we take the ferry from Sorrento and spend one full day in Capri. The island is simply breathtaking, one of the most beautiful places I’ve ever visited. Once you’re off the ferry, which leaves you at Marina Grande, if you’re not familiar with the island, or you’re visiting in August (as we usually do), it can appear chaotic at first. But have no fear, it’s pretty simple. 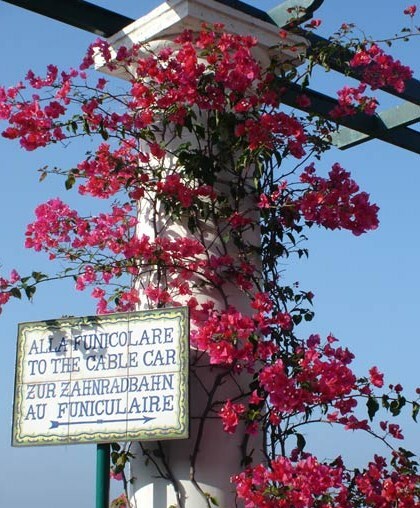 The quickest way to travel to the center of Capri from the port is by the island’s funicular, a little train which makes its way up to the center through the island’s lemon gardens in just 3 minutes. 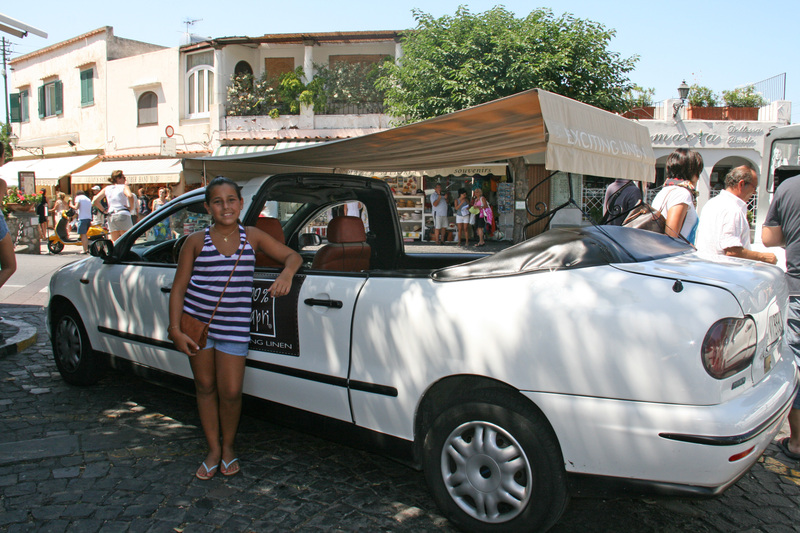 Or, if the queues are too long, as they often are in the summer months, you can take a bus, or my personal favorite, catch one of the famous open air taxis up to the center of Capri. Of course, you can also walk if you feel up to it and it’s not too hot. 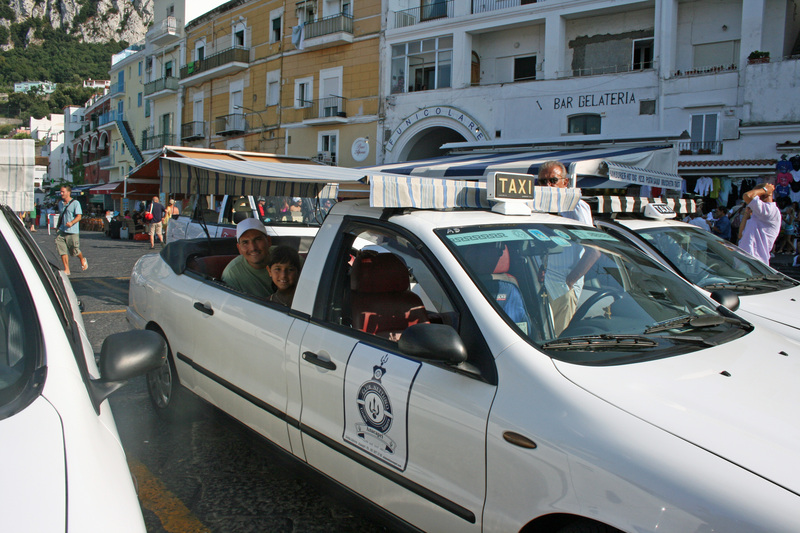 The taxis and buses will leave you at Piazza Umberto I, better known as the Piazzetta, the heart of Capri’s social life. There are numerous bars and cafes on the Piazzetta, perfect for people-watching and enjoying a cold drink on a hot summer day. On the Piazzetta is the 17th century Torre del Orologio with its beautiful clock, believed to be the old bell tower of the cathedral. Right off of the Piazzetta, are the main shopping streets where you can find many designer boutiques. If you would like to see the entire island, boat rides are offered that explore the coast. The amazing rock formations, called the Faraglioni, are truly a magnificent sight. The boat ride can also take you to the famous Grotta Azzurra (Blue Grotto), a sea cave along the coast of Capri known and admired by all for its brilliant blue color. Once you arrive near the grotto, you will be transferred into small wooden rowboats. Because there is no headroom, it is common for tourists to lie on their backs in order to clear the entryway. Warning: in the six times or so that I have visited Capri, I have only been able to enter the Blue Grotto once! This is because many times there is a 2-3 hour wait for one of the rowboats, during the busy months. Other times, it is impossible to visit, and the boats will not take tourists, if the sea levels are too high. The last time we tried, we had our hotel in Sorrento call the port in Capri very early in the morning to see if they were taking boats to the grotto. 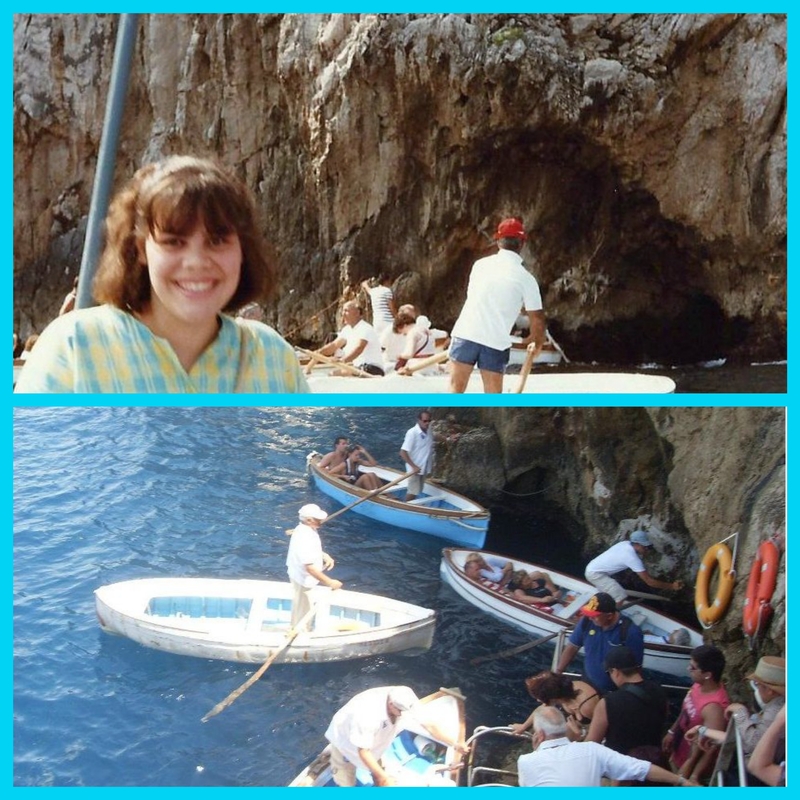 Although they were taking passengers that day, once we arrived at the grotto, there was a 3 hour wait for a rowboat. If you have your hotel check on a particular day, my recommendation would be to take the ferry to Capri as early as possible, as this will cut down your wait time for the rowboats. 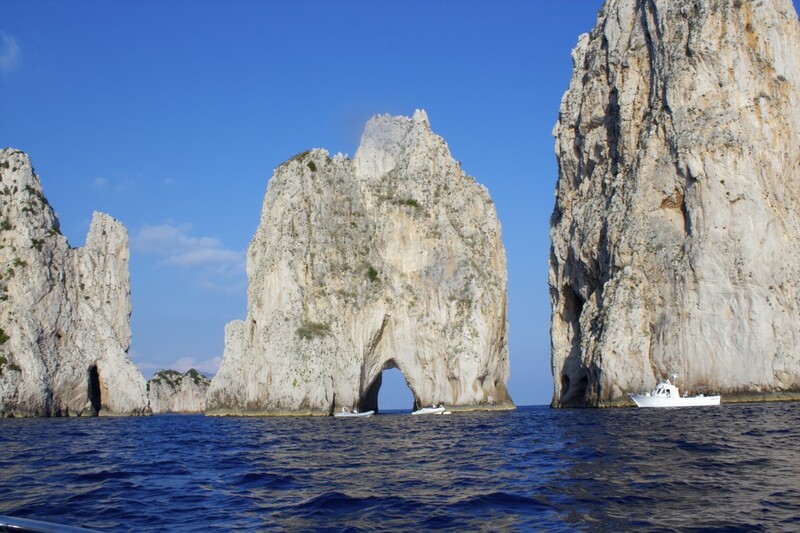 If you’re staying in Capri, you already have an advantage and can get on the earliest boat out to the grotto. To experience the “other” Capri, far from the glitz and glamour of the Piazzetta, you’ll need to take the 3 kilometer winding road up the cliffs to Anacapri (my favorite area on the island). 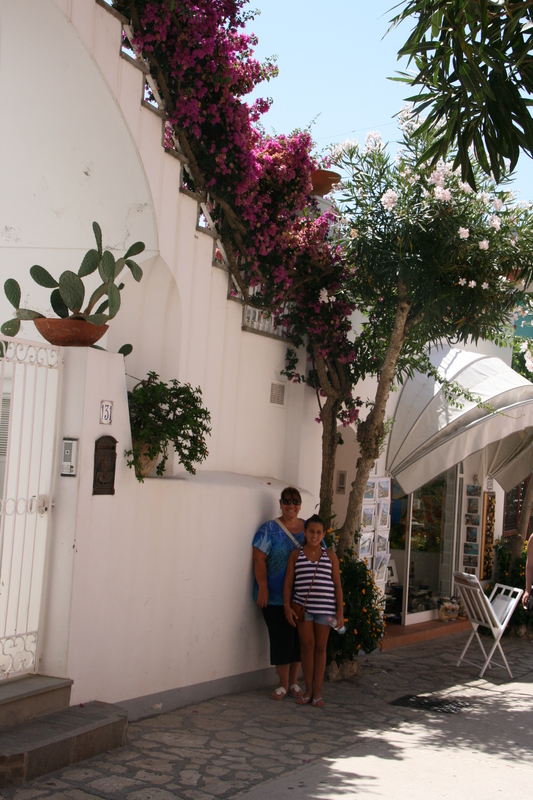 Here, in the picturesque historic center of Anacapri, you’ll discover a very different island with smaller streets, peaceful piazzas, and beautiful bougainvillea all around. 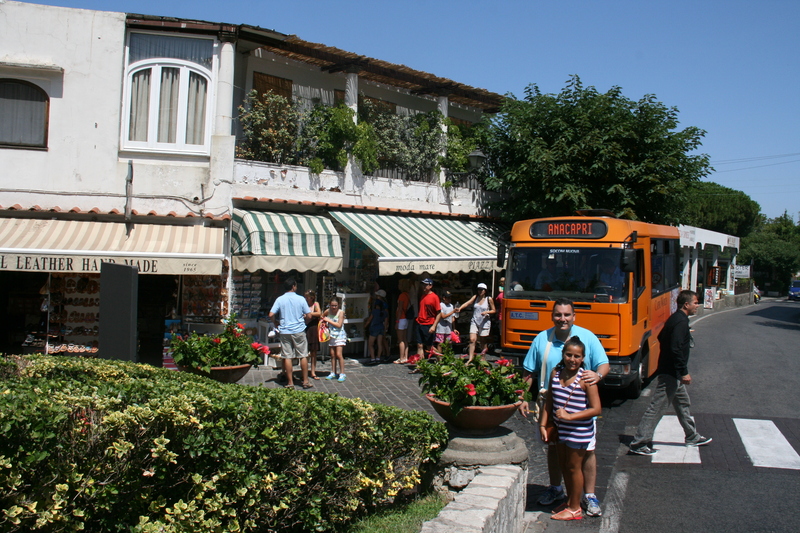 The bus or taxi will leave you at Piazza Vittoria, full of tourist shops and cafes. 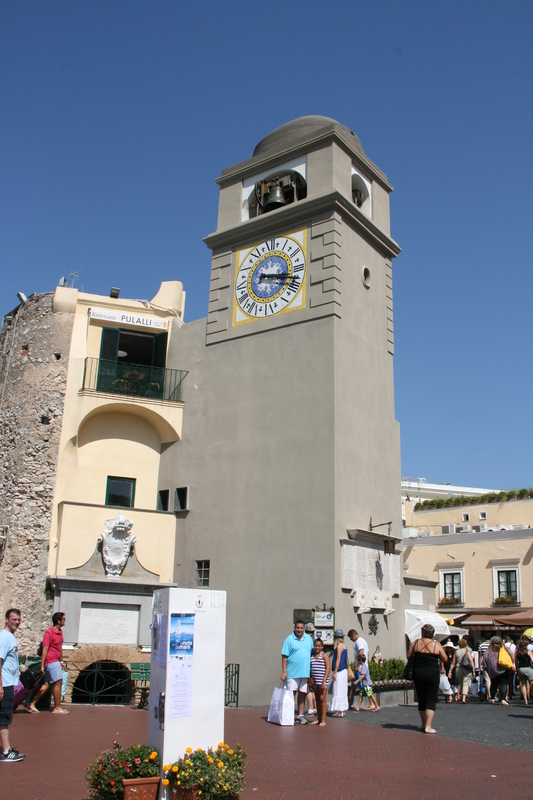 Piazza Vittoria is also where the Via Giuseppe Orlandi commences, a pedestrian road which winds its way right through the historic center of Anacapri. 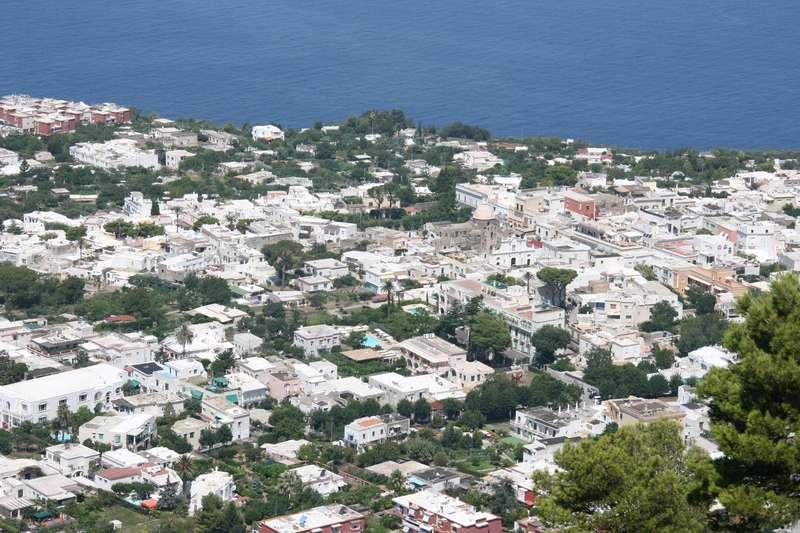 One of the most memorable things we did in Anacapri was take the chairlift up to Monte Solaro, the highest point of the mountain (1,932 feet) with 360° views. 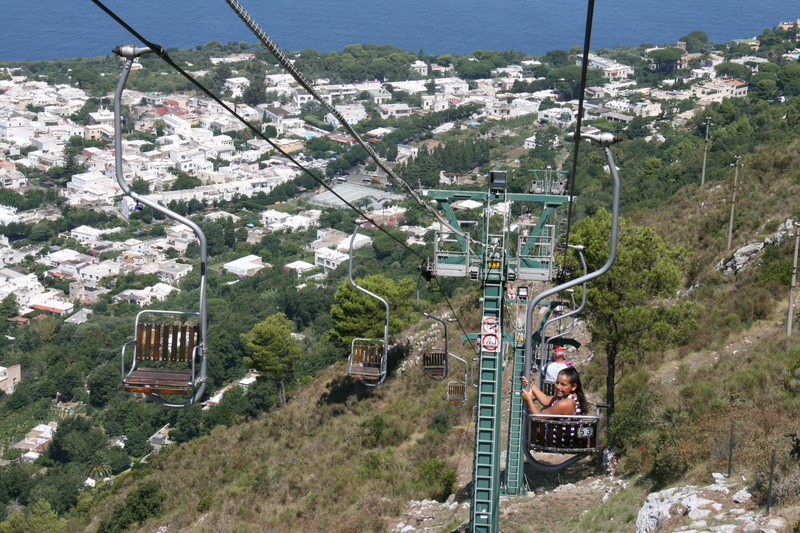 The first time I came across this chairlift was back in 1996, when my husband and I first visited Anacapri. He right away wanted to take the ride up, and I remember telling him not all the money in the world would get me to ride this thing! So he didn’t go either (I felt kind of guilty). Fast forward many years later, on our first trip here with our daughter, and of course they both went on it. I was once again terrified and decided to window shop while they took the ride up. Near the chairlift is the other shopping strip with hotels and more famous historical sites. Well as they say, the third time’s the charm. 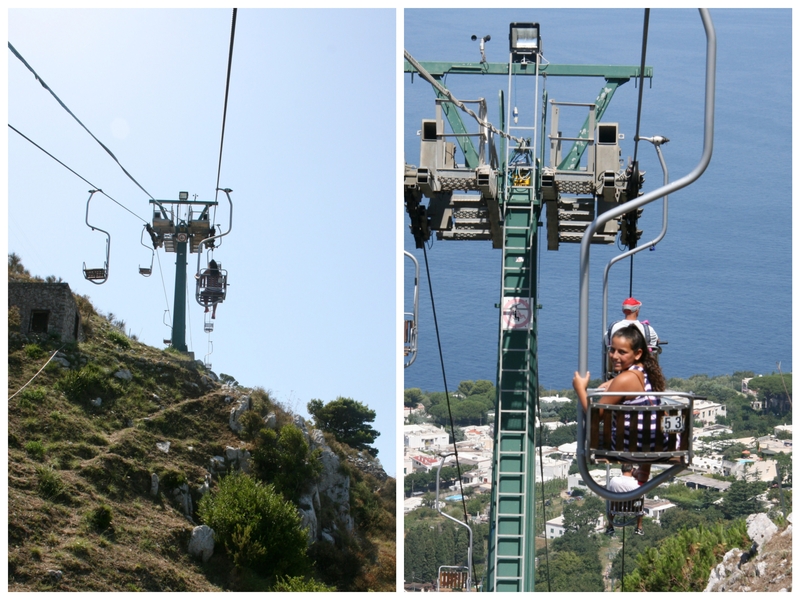 On my next visit to Anacapri, hubby and daughter begged me to take the ride, and promised I would not regret it. Boy, were they right! I couldn’t believe what I had been missing. The chairlift is a 10 minute ride up but there were definitely a few moments, especially when it tilts upwards towards the end, where I felt my heartbeat speed up. 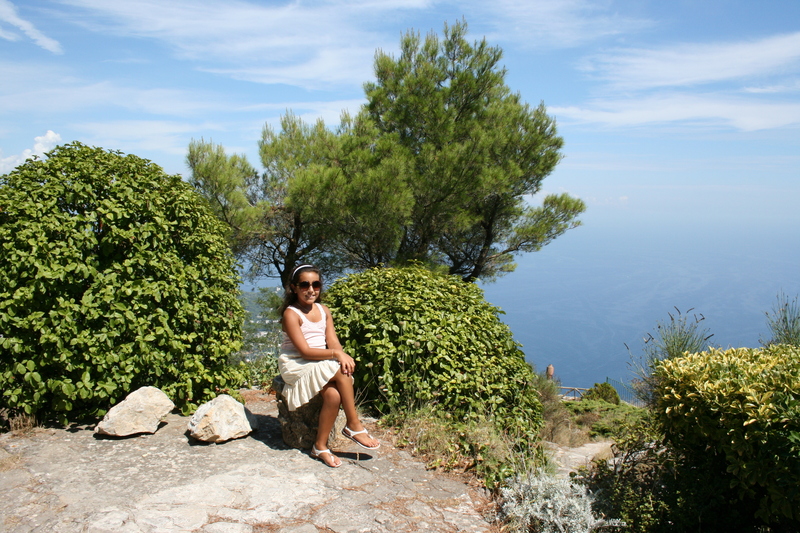 But once you arrive at the top…priceless, the most spectacular views of the Bays of Naples and Salerno around. You will not want to forget your camera on this ride! There is also a cafe at the top, so you can spend some time taking in the views, while sipping a cool drink and taking photos (always taking photos), before you take the ride back down. 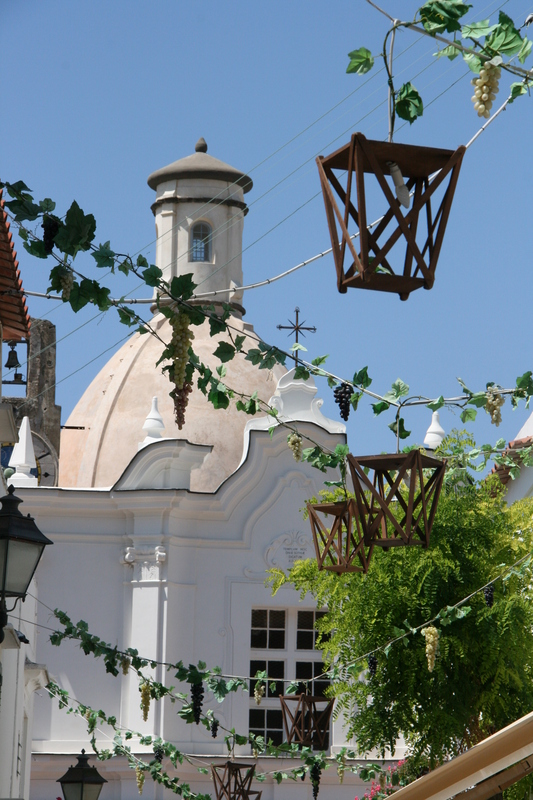 Piazza Armando Diaz is considered the center of life in Anacapri, where the locals can often be found relaxing. 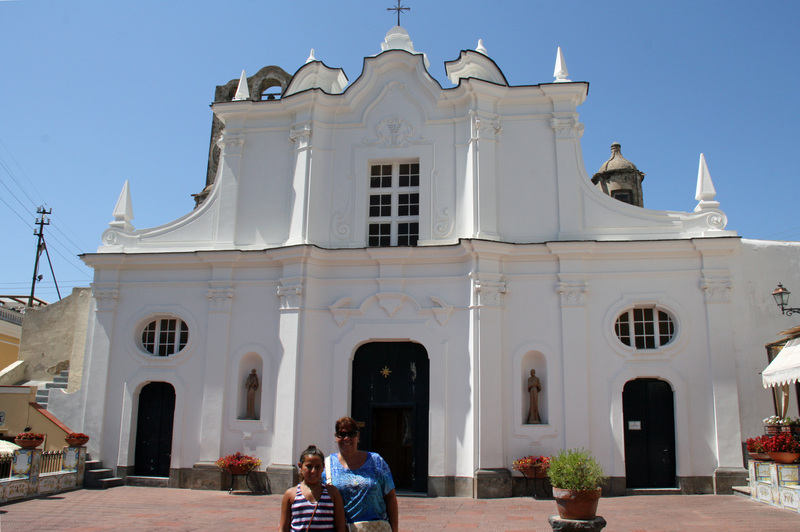 In the center of the piazza, is the Chiesa di Santa Sofia, which is beautiful. The church was constructed in 1510 to replace Anacapri’s old Parish Church of Santa Maria di Costantinopoli. Definitely worth to take a look inside. While all of Capri is full of designer boutiques and shops selling all sorts of items, I have to single out my two favorite stores. The first one is Margherita Boutique (Via G. Orlandi, 144). Walking down the pedestrian Via G. Orlandi, you continue past the church of Santa Sofia, and the boutique will be on your right hand side. 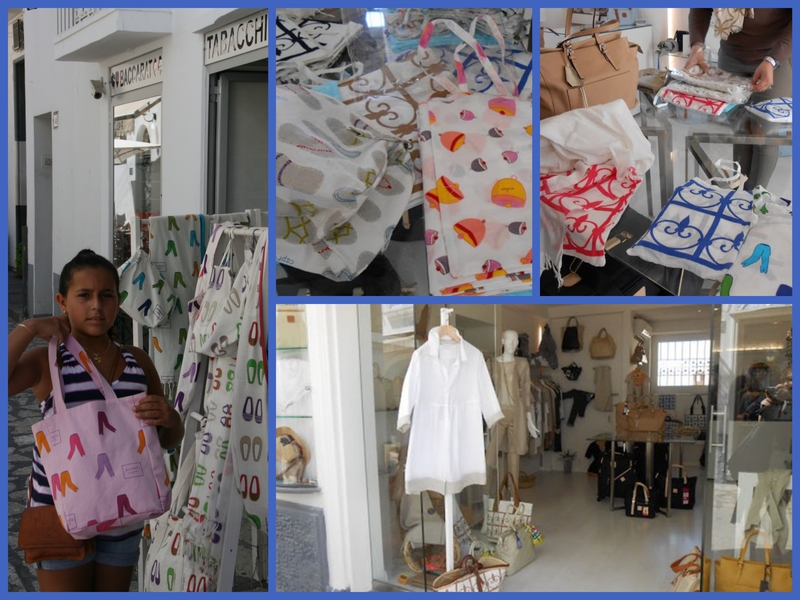 They sell beautiful cotton clothing with prints of anchors, Capri pants, beautiful lively blues, representing the sea surrounding Capri and also prints of cancelli (the wrought-iron door elements found in Anacapri). They also carry beautiful leather bags and some carry-on luggage pieces, of which I bought a few (couldn’t resist)! Boutique Margherita…my daughter picking out her bag! The other shop my daughter enjoys stopping in every time is La Bottega Caprese (Via G. Orlandi, 26), right on Piazza Vittoria. 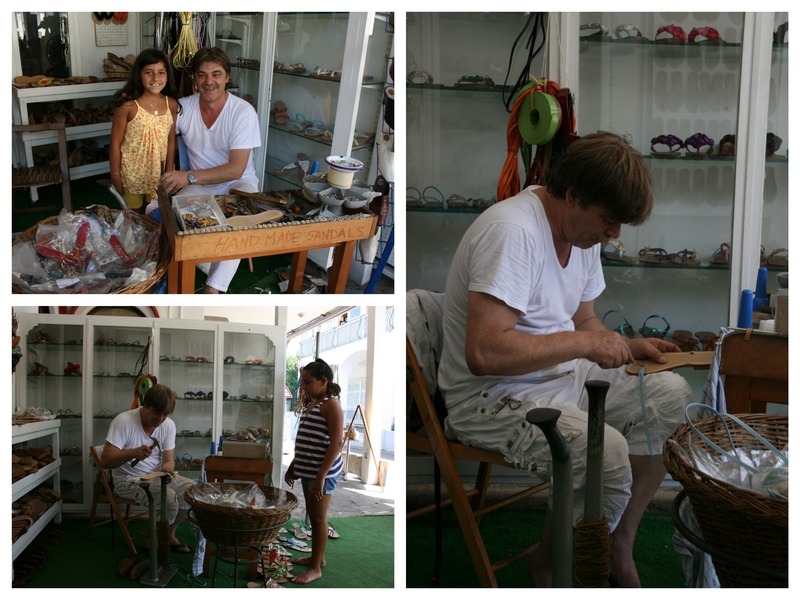 This shop sells custom-made leather sandals, where the owner himself, measures your foot and creates the sandal on your foot, after you’ve chosen the color and style of straps. She really gets a kick out of choosing her own sandals. They’re a bit pricey, but what isn’t on this island? 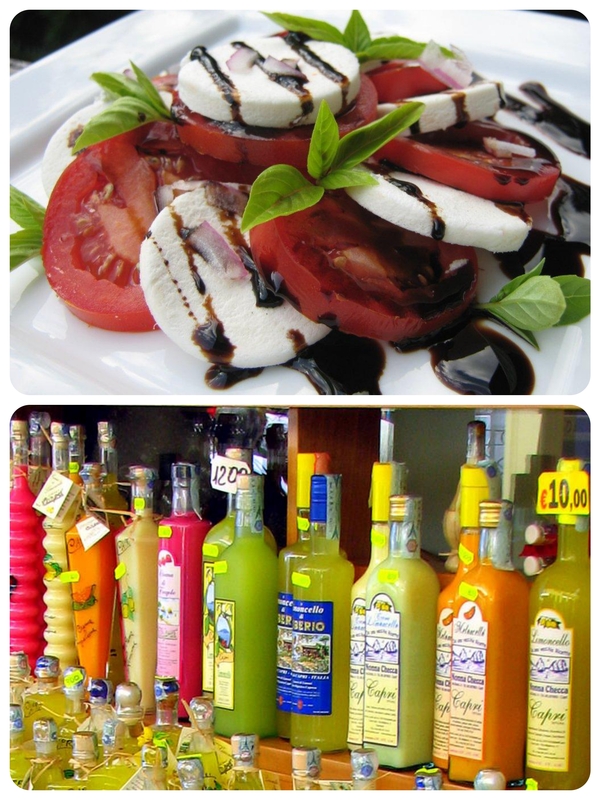 Delicious Caprese salad and beautiful limoncello bottles for sale. One thing is for sure, on your visit to Capri, you have to try a Caprese salad (first created on the island in the 1950s). The delicious mozzarella cheese combined perfectly with the tomatoes and basil is amazing! Capri is also known for its lemon trees grown throughout the island. Not only do these lemons form part of the beautiful scenery, but they are also used to produce limoncello, a sweet, lemony, liquor prevalent on the island. Delicious any time of the day. Have you visited the Isle of Capri? If so, I would love to hear what you enjoyed most! Here are a few more photos of our trips, enjoy! 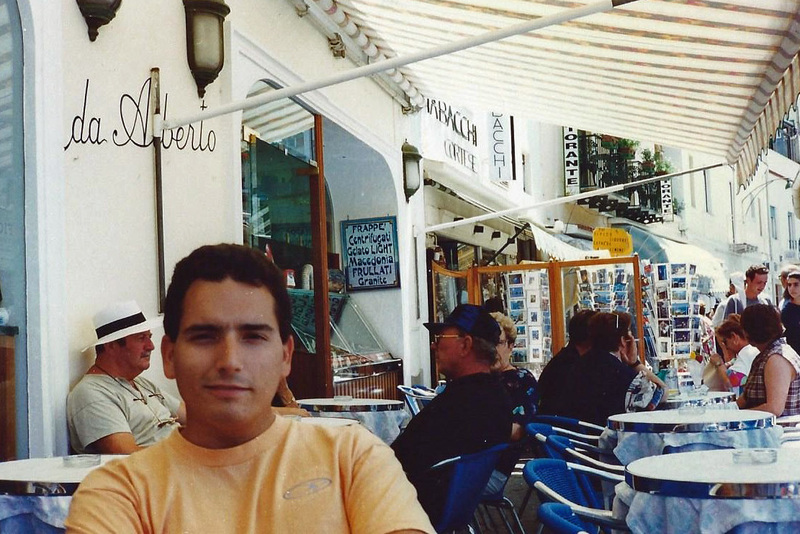 Hubby relaxing in a cafe on the Piazzetta, back in the day on our first trip there! I would love to go to Capri! What a fantastic vacation that would be. How beautiful! It looks like your family is having a fabulous trip. I would love to visit there with my family one day. Oh my goodness, that is simply beautiful! All of it! How neat are those open-air taxis!!! And I LOVE Caprese salad…but I’ll bet the ones they make there are the BEST!!! Italy is such a beautiful place I spent a lot of time there and Malta,the Blue Grotto in Malta is also really beautiful. What a beautiful place! 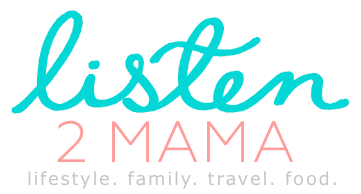 We are planning a trip there in the near future.. thanks for this post! Amazing post. It looks so beautiful! I wish I could see the beauty of it one day. Wow! Looks like an amazing vacation. My husband and I are saving for a trip here, Ireland and London for our 25th anniversary in a couple more years. Thanks for the great tips, I am taking notes. Love the pictures also. It looks absolutely gorgeous. I would LOVE to make it to Italy one of these days. Your photos are stunning! The single-rider chair lift would scare me though! That is just so beautiful. All of the pictures are amazing. I understand about the chairlift. I have taken a couple of those rides myself but in the end, it has always been worth it. Such a beautiful place. Loved all the photos you shared. What a great vacation! Stunning locations! It is on my top places to visit! Great pictures BTW. The photos are beautiful! I definitely want to visit now! I am so jelly! I definitely wanna go to Capri when I go to Italy! So beautiful! How beautiful! This looks like such a great place. wow what a gorgeous place to visit. Must add this to my must see list of places. So beautiful. That Caprese salad looks delicious. This is definitely on my bucket travel list. Wow, everything is still so beautiful in Capri! I can only hope to have a chance to visit in this life!! I love the look of the caprese. So gorgeous! Definitely on my list of places to go someday now. Wow! Beautiful Pictures!! Italy is in mom top 3 visit before I die. I love the detail you gave as well! Those are such gorgeous pictures! I would love to take that vacation! Beautiful! What a gorgeous trip! 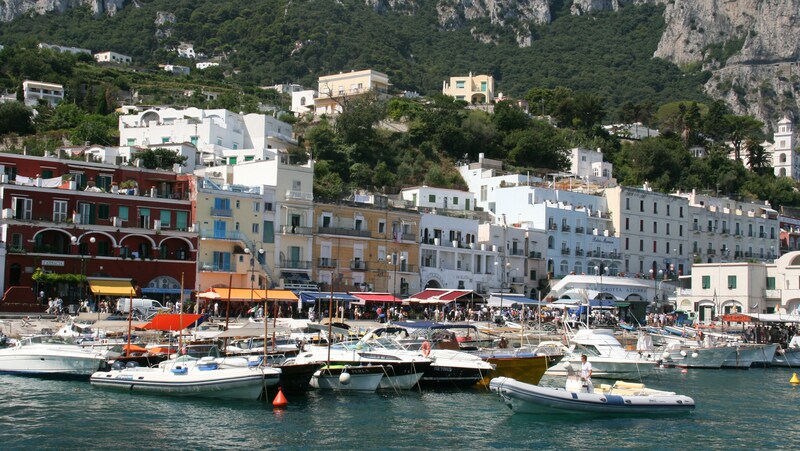 I have always wanted to travel to Capri and now I REALLY want to!!! So happy you were able to have such a fabulous time! What an absolutely gorgeous area. I would just love to pay a visit there!!! What a gorgeous location. I would love to visit there sometime! I really want to visit there now. These pictures are gorgeous. You are a very talented photographer. 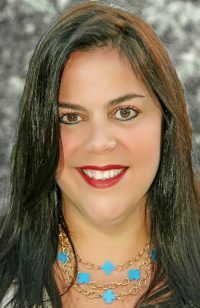 Thanks, yes I love to take photos on these trips, and you will love Capri!!! It looks like you guys had fun! I would LOVE to go one day! I also LOVE those bags your daughter was picking out! I want one too! She uses that bag all the time!